Blue bird trails are created to humor these birds that can be quite fussy about the location of their homes. For this reason they are rarely spotted in yards or in urban areas. Some people say that bird houses and bluebirds don't mix simply because their man made habitats are too easily taken over by other types of birds. It is likely that the people that think that live in the city where bird houses and bluebirds don't mix at all. In fact you very rarely see a bluebird in an urban area of any kind as they prefer to live near pasture and farmland.It is a good idea to figure out the migrating habits of the blue birds in your area and build the birdhouses in those areas. Strategically setting up bluebird houses so that they follow the bird's natural nesting and migrating patterns is called building a bluebird trail. Building a bluebird trail means mounting several bluebird houses in an area that is a known bluebird nesting location. You can find this out either through observation and also by consulting with other bird lovers in your area that are interested in conserving this often threatened species. Bluebirds are a bit fussy when it comes to birdhouses possibly because they may have some instinctual knowledge that starlings and sparrows are threatening their breed. Building a bluebird trail helps the bluebird nest safely out of reach of predators and keeps them safer away from bigger bully birds such as starlings and European sparrows. The best place to build a trail of bluebird houses is in areas that they prefer as a natural habitat. 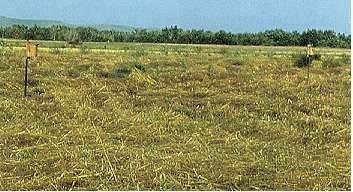 This includes open areas with sparse ground cover as many of their predators hide in bushes and thick foliage. They also prefer areas that have plenty of perch sites such as telephone wires or wire fence lines. The best bird houses for bluebirds are wooden bird houses that are located in open rural areas. The ideal scenario would be houses that are perched about half way up a telephone pole. If perched too high sparrows invade bird houses. Bluebirds vacate at the first sign of a predator so building the houses on a bird house trail at the right heights is crucial. 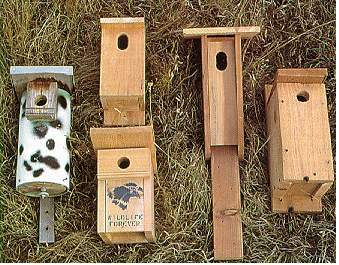 Bluebird trails that are the most appealing to bluebirds consist of box shaped dwellings made of cedar or redwood. This is because bluebirds eat the bugs that nest in these types of natural woods. A bluebird box should never have a perch sticking out from it as that attracts sparrows and wrens that could bully the nesting bluebirds out of their home. The nesting holes for Eastern bluebirds should have a diameter of half of an inch. Western bluebirds will use a one and a half inch entrance. Also keep in mind that varnishing or painting bluebird house is not a good tactic as the bugs that they feed on in wood find these substances toxic. 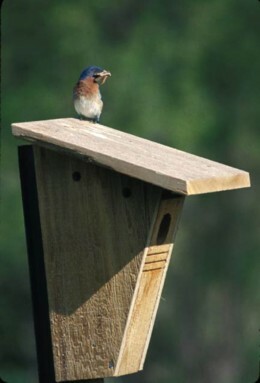 The perfect bluebird house is well ventilated and has drainage holes so that rain can drain out. Bluebirds always choose the houses on the bluebird trail that makes them feel the most secure. They will feel the safest if the bottom of the bluebird house is covered with hardware cloth so that snakes and squirrels cannot somehow get at them from beneath. It is also a good idea to grease any perches, poles or platforms around the bluebird house as this makes it harder for larger birds to get a grip and stake out the bluebird home. Although attracting blue birds with houses or boxes can be a bit challenging (it is because they are so fussy about their habitat! ).